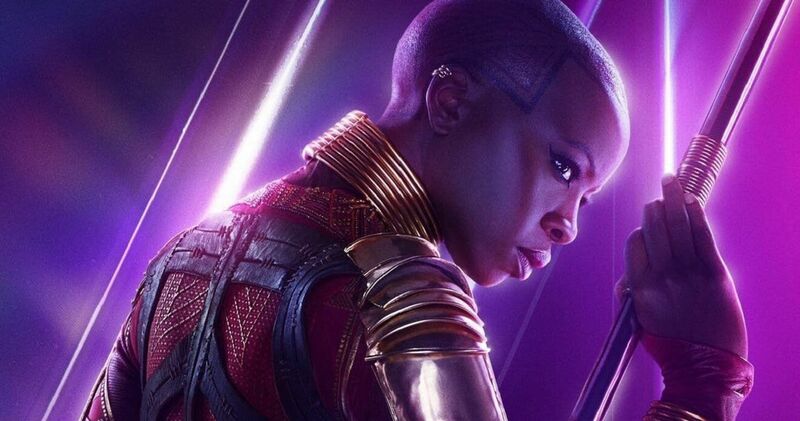 When Black Panther released in early 2018, a lot of fans loved Danai Gurira's portrayal of Okoye, the leader of the Dora Milaje. The hero later appeared in Avengers: Infinity War, though her role in that film was much reduced. However, there's a lot you might have missed about Okoye in those two movies and the Marvel Cinematic Universe as a whole. Although it ended up on the cutting room floor, a deleted scene for Black Panther confirmed that W'Kabi and Okoye are married. It's unclear if that relationship will be reestablished in future films in the series, but that union is actually quite a departure from the Dora Milaje in the comics. The group, which first appeared in Christopher Priest and Mark Texeira's 1998 comic Black Panther #1, serve as potential wives for the king of Wakanda, which film producer Nate Moore called "creepy" last year. There's also a lot to the Dora Milaje's outfits and make-up in the film which might be surprising to those interested in the inspiration for the movie's look. Check out the video below for more things you might not have realized about Okoye in the MCU. Although Okoye survived the events of Infinity War, T'Challa/Black Panther did not. However, there are already plans to make a second film in that character's self-titled franchise, so it's incredibly likely that Okoye will also play a major role in that sequel. It's also pretty clear from the promotional trailer for Spider-Man: From From Home -- the main character of which was also turned to dust -- that Thanos' snap will be undone, so T'Challa will also almost certainly return to life. Gurira was recently confirmed as leaving AMC's The Walking Dead, on which she plays Michonne. Her increasing role in the Marvel Cinematic Universe is seemingly one of the main reasons behind that exit.